When creating a new presentation in Google Slides, you can now add in videos not only from YouTube, but also ones you have stored in Google Drive. The option to install videos from Google Drive into Slides presentations isn’t live just yet, but will be arriving over the course of the next two weeks. 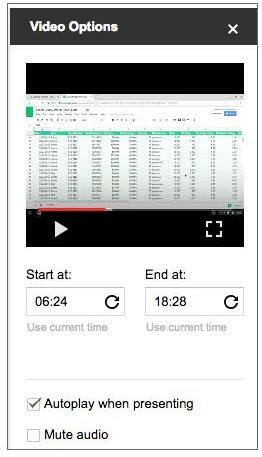 Once it’s live you’ll be able to add in a video that’s in Drive, adding in a lot more options for including video. When you add the video you can choose whether it autoplays, or when to start and stop the video as well as if it should play muted or with full audio. The option to include videos stored on Google Drive adds a layer of privacy for you, with users that don’t have permission to access the video prompted to ask for permission. Once they’ve gotten permission they’ll be able to view it like a normal video in a presentation. While the feature looks great, you can only add it in the web editor at this stage, but knowing Google the ability to add them from the Android app won’t be too far away.